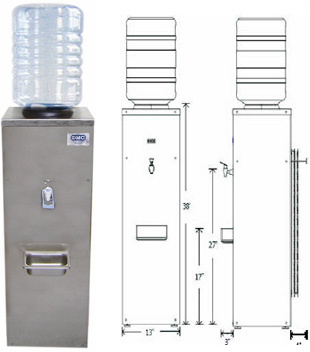 ACC manufactures the first line of truly industrial bottled-water coolers. Made of 316 stainless steel, all are designed specifically for corrosive, dusty, hot, humid, and, when necessary, hazardous (explosive) locations. When specified, ACC makes units suitable for hazardous-duty (“explosion-proof” or “flame-proof”) conditions. We use UL-recognized hazardous-duty compressors appropriate for the classification of the area. ACC seals the coolers in the factory for fast and easy installation, and they retain the same corrosion resistance and other harsh-duty features as ACC's standard coolers. Cabinet: All corrosion-resistant stainless steel type-316, inside and outside including interior shelves, mountings and drip basin. Satin finish on all exterior surfaces for an attractive and easily-cleaned lustrous appearance. Bottle-support ring made of durable and corrosion-resistant polypropylene. Controls: Protected from environment by installation inside NEMA 4 (IP65) or NEMA 4/7/9 enclosure. Valves: Self-closing, no-drip. Made from durable and corrosion-resistant polypropylene. Cold Water Reservoir: Flat-bottom stainless steel basin with approximately 2-1/2 quarts (2.4 liters) useable capacity and polypropylene fittings. Corrosion-protected copper evaporator coil is wrapped around reservoir, insulated with closed-cell elastomer. Corrosion Protection: Capillary tube, filter-dryer, two access valves and all other metal tubing protected with either a special epoxy coating (e-coat) with near-zero porosity applied electrostatically and baked or with special enamel paint to protect them from acidic and caustic corrosion. Condenser: Three rows deep, sized for high ambient temperatures and high altitudes, and protected against acidic and other corrosion with a special epoxy coating (e-coat) with near-zero porosity applied electrostatically and baked. Compressor: Andover Protection Systems’ Model EEG (for 115/60/1) or APS Model EEJ (220-240/50-60/1). These compressors are specifically designed for and recognized by UL (Underwriters Laboratories) for use in hazardous (“explosive”) areas, even those requiring explosion-proof or flameproof equipment. Shipping Dimensions: Approximately 73 lbs. and 8.6 cubic feet.